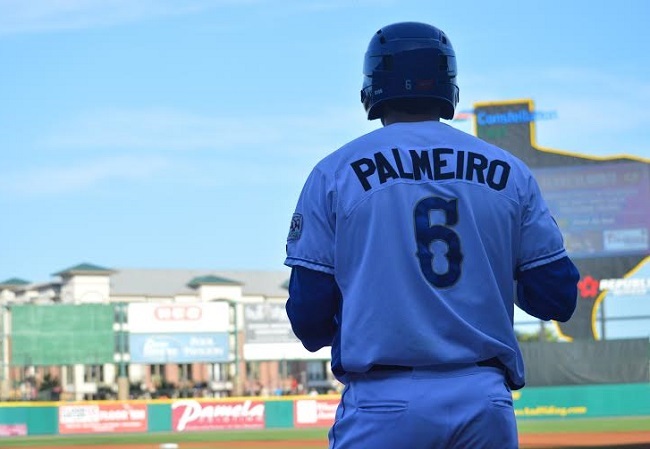 The Sugar Land Skeeters and manager Gary Gaetti announced the signing of four-time MLB All-Star and three-time Gold Glove winner, Rafael Palmeiro to the Skeeters. Rafael joins his oldest son, Patrick, for the final three games of the season. Palmeiro is one of five members of the 500 home run and 3,000 hit club, which includes New York Yankees DH Alex Rodriguez and Hall of Famers Hank Aaron, Willie Mays and Eddie Murray. Palmeiro will make his debut with Sugar Land at Constellation Field on Friday evening and is expected to play on Saturday and Sundayfor the final games against the Camden Riversharks. First pitch for Friday is slated for 7:05 PM and Saturday’s game will begin at 6:05 PM. Sunday’s season finale will begin at 5:05 PM. Palmeiro, 50, was a first-round selection, 22nd-overall, of the 1985 draft out of Mississippi State where he was the first and only member of the SEC to win the Triple Crown. A .288 career hitter, Palmeiro boasts 569 long balls and 3,020 hits over his 20-year big league career with the Chicago Cubs, Baltimore Orioles and Texas Rangers. He led all of Major League Baseball in hits with 191 in 1990, doubles (49) in ’91 and runs (124) in ’93. The first baseman won three-straight Gold Gloves from 1997-99 with the Texas Rangers and Baltimore Orioles. For media credential requests, contact Molly Onyett with the Skeeters at monyett@sugarlandskeeters.com. The Skeeters continue the 2015 campaign against Camden this evening at the friendly confines of Constellation Field. First pitch is slated for 7:05 PM with gates opening at 6. Fans can follow along with the action on ESPN3.com. Tickets are still available for the 2015 season. Sign up today by calling the box office at 281-240-4487 to join the swarm. Visit SugarLandSkeeters.com and follow @SL_Skeeters on Twitter, Instagram and Facebook for all the latest news on the team. The Sugar Land Skeeters are led by former Major Leaguer Gary Gaetti and play at Constellation Field, a state-of-the art stadium located at the intersection of State Highway 6 and U.S. Highway 90A in Sugar Land. The Skeeters play 140 regular season games in the Atlantic League, considered the highest level of Minor League Baseball. Atlantic League players are “Major League ready” and in the last 16 years, over 600 players have graduated from Atlantic League clubs to Major League organizations, making the League a preferred route for experienced players to be scouted by Major League Baseball. In 2014, the Sugar Land Skeeters announced their ground-breaking, minor league baseball agreement with ESPN, for the exclusive rights to place games on its digital and television networks. All 2015 home games will be produced live and may be accessible online at WatchESPN.com and SugarLandSkeeters.com, on smartphones and tablets via the WatchESPN app and streamed on televisions through ESPN on Xbox LIVE to Gold members, Apple TV, Roku and Amazon Fire TV.